Written by the great poet Budha Shridhara (13th century), this Puranic epic is a unique Apabhramsha work. It gives an account of the Jaina shalakapurusha Tirthankara Parshvanatha’s life. This story of the nine births and bhavantaras (different states of existence) of the hero presents a picture of his glorious life in which samskaras or impressions acquired during various states of existence are helpful in the emergence of his tirthankara nature. Not only are these events of Parshvanatha’s different states of existence mysterious and amazing, but the style of their narration is also so effective that it evokes a glorious picture of the hero’s life. The flow of the narrative is well planned and covers all aspects of the work as an epic. Budha Shridhara was not a mere poet. He was a witness and a brilliant scholar of the medieval Shramana culture and Indian history, particularly of the contemporaneous Tomara dynasty rule in Delhi and the society of the times. 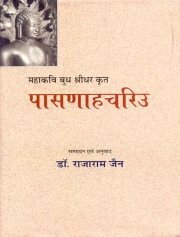 It is because of this that even though the subject matter of Pasanaha Chariu is Puranic, the poet has been able to portray contemporaneous historical facts on the vast canvas of an epic-poem with the help of metaphor and give it the form of a historical and Puranic poetic work The renowned Indologist scholar Dr. Rajaram Jain has painstakingly edited and translated this work. He has also enhanced its usefulness for the inquisitive readers by writing an extensive and multi-dimensional introduction. The Bharatiya Jnanpith is happy to have got an opportunity to publish yet another great Apabhramsha work. This book is in Sanskrit with Hindi Translation.